Management Pack extends VMware vRealize Operations (vROps) Manager capabilities with vital resource monitoring, management, and troubleshooting for the Citrix XenDesktop Infrastructure. Today Blue Medora, a software company specializing in cloud management, announced the release of their newest Management Pack for Citrix Systems, Inc. XenDesktop. The Management Pack for Citrix XenDesktop extends the functionality of VMware vRealize Operations Manager by enabling XenDesktop site administrators to track the health of their 'Citrix Virtual Desktop Infrastructure (VDI) on VMware' environment from a single integrated console. “We see increasing proliferation of Citrix’s virtual desktop solution, XenDesktop, across the enterprise,” said Nathan Owen, CEO, Blue Medora. 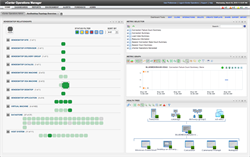 “Enabling VMware vRealize customers to leverage VMware vROps for monitoring, alerting, predictive analytics, and capacity planning of their Citrix VDI environments was an obvious next step in expanding vROps ability to monitor and manage End User Computing environments"
Building on the comprehensive visibility of vROps, Blue Medora’s latest Management Pack allows administrators to proactively monitor, troubleshoot and remediate issues across the Citrix XenDesktop-based environment. Comprehensive performance status and metrics to aid in capacity planning and performance optimization. Headquartered in Grand Rapids, Michigan, Blue Medora is a leading software company that believes that true visibility into business critical applications is only achieved when enterprise cloud management systems communicate without barriers. Blue Medora’s rapidly growing portfolio of VMware-focused software solutions extend VMware’s cloud management platform, VMware vRealize Operations Manager, via integration of health, availability, performance, and capacity management as well as predictive analytics for NetApp, Cisco, Oracle, IBM, and SAP environments.